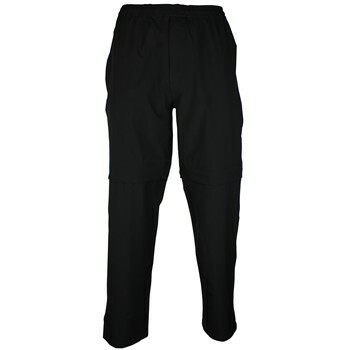 The Glen Echo RP-2120 Stretch-Tech Rain Pants easily convert into rain shorts with zip-off legs and feature a quiet Streth-Tech shell, which is polymer coated providing waterproofing, breathability, and extreme flexibility. Its fine stretch mesh interior enhances movement and ventilation. Side pass-through pockets with waterproof zippers. Large cargo back pocket with waterproof zippers. Elastic waist with drawstring for optimal fit. Adjustable ankles with side-leg zippers. and they don't sound like you're wearing cheap snow suit pants when you walk or swing.